QDP designs and manufactures easy to hang mini-wall hangers, standard size wall hangers, and maxi-wall hangers for quilts sized from 10" to 116" wide. These clamping style hangers are available in a variety of colors and styles designed to pair nicely with virtually any color in your quilt and any room decor. Besides being the easiest quilt wall hanger to install and use, here are a few more reasons why you should choose a QDP hanger. 100% satisfaction guarantee. Returns, or exchanges are free! The easiest way to install your quilt in a wall hanger is to do it off the wall. This way you aren't fighting gravity and won't need the assistance of an extra set of hands. QDP's unique hanging system is designed to do just that. 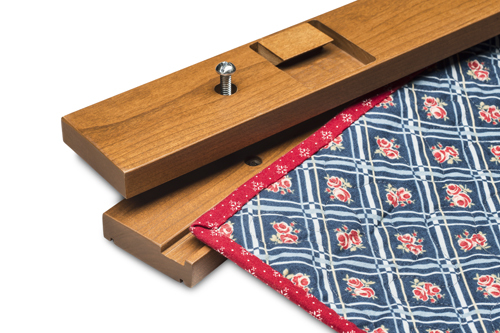 Separate the front and back halves of the hanger, place your quilt in the groove, and reconnect the halves on a convenient, flat surface. Wedges on the back of the hanger simply slide over similar wedges attached to your wall (all of the hardware is included in your purchase). This eliminates trying to line up keyhole slots, nails or screws in a blind fashion. Simply slide the entire quilt and hanger on and off the wall to change out your quilt as often as you like. The wall hanger should always be longer than the side of the quilt you want to hang. This insures that the binding is supported the whole length of the quilt. Simply measure the length of your quilt and select a hanger that is the next size up. 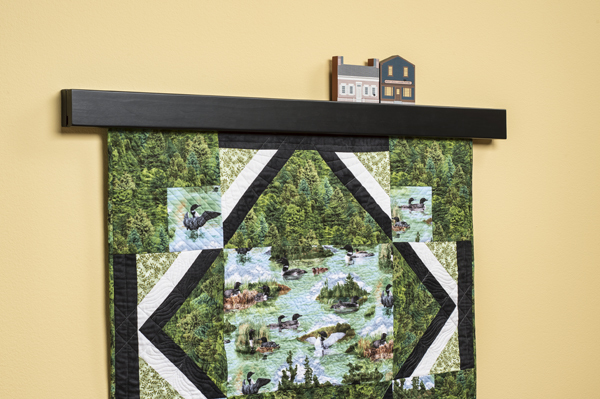 For mini-wall hangers, they are actually 1/2" longer than stated, because most miniature quilts and blocks will come in increments of two inches. So if you are sizing a mini hanger for a 10" block, pick a 10" hanger. All of QDP's hangers are available in three different edge treatments designed to fit most any furniture style you may have. The clamping system is not visible. keeping the front of the hangers free from adornment, letting your eye focus on the quilt, not the hanger. Nicely beveled edges for that straight line look familiar in Mission style furniture. Beaded edges add interest to the hanger without overwhelming the appearance. 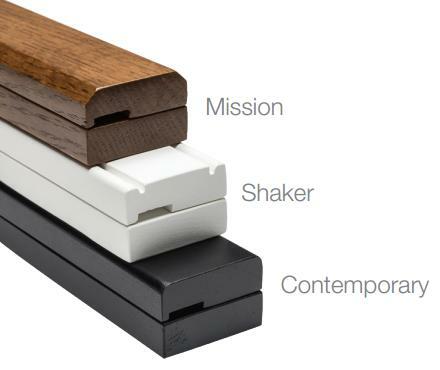 A simple edge radius softens the hanger, blending well with contemporary or modern furniture.